THREE GREAT SIZES : 6.7 cubic feet, 10.2 cubic feet and 13.6 cubic feet. The L&L Kilns eQuad Pro Series kilns are designed for heavy usage at high-fire temperatures. They are rated Cone 10 with plenty of power for firing cone 6 and higher everyday! These kilns feature Quad Element Design. The quad elements are super heavy-duty elements which wrap four times in each 9” high section. Quad elements and included 3 zone control ensure even firing top to bottom throughout your kiln. Equad kilns include stand, peep hole plugs, easy to understand manual, an L&L hard ceramic element holders. The lid is spring loaded for easy opening. When open, rests at an angle away from the kiln so that the loading is easy and unobstructed. 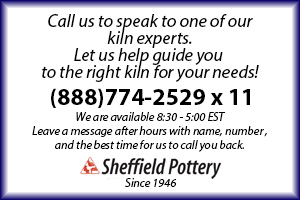 The floor of eQuad series kilns are reversible extending the life of your kiln ! L&L hard ceramic element holders are included. These protect the bricks from bumps and chipping.